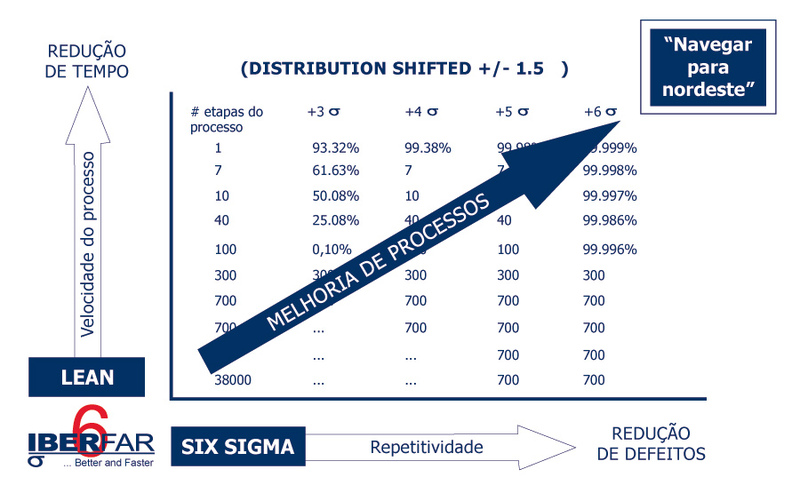 Lean Six Sigma! What is it? The Lean and the Six Sigma are two management philosophies, and although they were implemented in an independent way during the 80's and 90's by companies and organizations that are market leaders, are now used simultaneously and synergistically. The Lean focuses on the reduction of time between customer order and its delivery, eliminating all forms of waste identified in the organization's value chain. The Six Sigma focuses on reducing variability of the features that are critical to customer and product quality, guaranteed to do well the first time. IBERFAR, joining these two management philosophies, Lean and Six Sigma, guarantees the way to the northeast, that is, to perfection! How does IBERFAR applies Lean Six Sigma? IBERFAR applies Lean Six Sigma based on the strategy defined by the company, using different methods, depending on if the process involves causes of common or special variability. When causes of common variability are involved, IBERFAR applies KAIZEN methods to eliminate at the same time, waste and common sources of variability. The most used KAIZEN are the KAIZEN of process, the SMED and GEMBA Kaizen (6S). When causes of special variability are involved, IBERFAR implements the Statistical Control Process System, along with Measurement Systems Analysis (MSA). When the causes of special variability have been removed, the system is stable and the process capacity is less than the desirable capacity, IBERFAR implements KAIZENS to eliminate the waste and the causes of common variability and thus increase process capability and better serve their customers. Since when does IBERFAR applies Lean Six Sigma? IBERFAR started his path to operational excellence in 2007. Since then it has not stopped on its way to perfection. The implemented projects are numerous, including projects related to the improvement of the support processes (administrative), the improvement of operational processes (manufacturing, packaging, quality control) and the improvement of logistical processes. What do our clients win with Lean Six Sigma? All improvement efforts by IBERFAR have as a starting point gains for CUSTOMERS and for IBERFAR. Reducing batch sizes, ensuring we produce only the quantities that our customers need and thus avoiding the finished product stoped in storage.